These days, I prepare a lot of lunches for a lot of people. Not only do I prepare them at work for my clients, I also prepare them at home for my husband to take to work and for my son to take to school. I guess you could call me the “Happy Lunch Lady”. For us as a family, it could get pretty expensive rather quickly if everyone was eating lunch out every day, not to mention it wouldn’t really be all that healthy either. And though my son pretty much prefers to stick to sandwiches for his school lunches, my husband loves to have a variety of things to munch on, all with a good balance of protein, veggies and carbs. 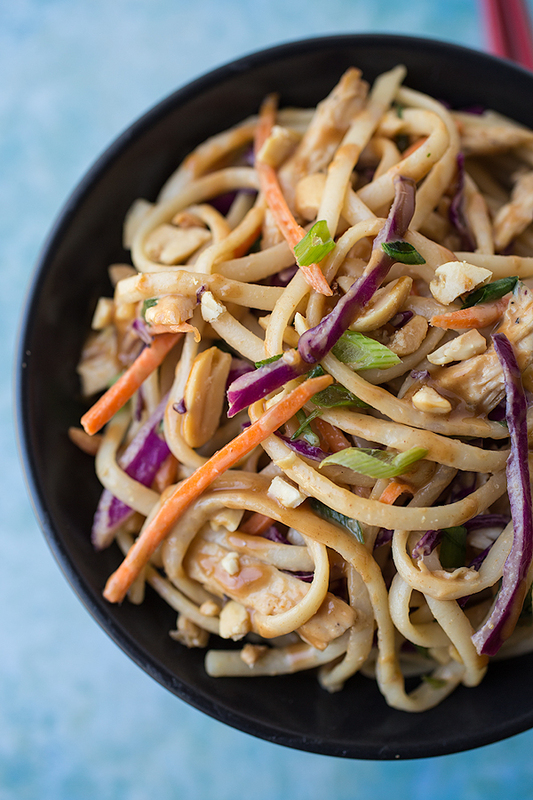 And whenever I make this Asian Peanut Noodle Salad for us and then pack some for his lunch the next day, he considers it a scrumptious little treat. 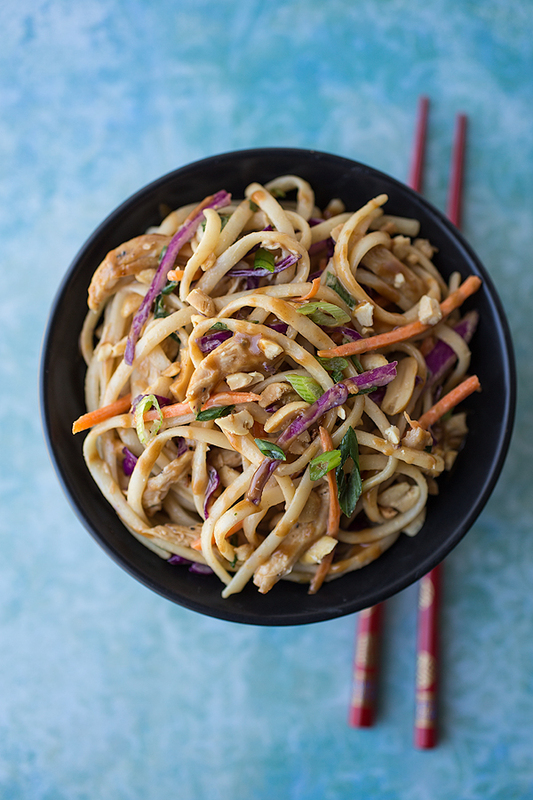 The flavors in the sauce are smooth and complex from the warm flavor of the peanut butter, and the honey and soy give it the perfect, sweet-savory balance with a hint of heat from the Sriracha; and, of course, then there are the noodles, veggies, peanuts and chicken, which create each deliciously textured bite. Really, what’s not to adore? And the best part is that it’s easy to whip up, store in a snap-top container and take to work, which means that lunch will be anything but boring, and practically “gourmet”. Made with love at home with healthy ingredients, what more could you ask for from your lunch? 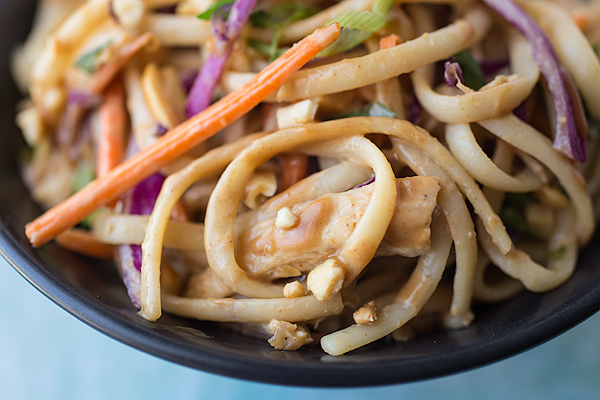 Sometimes, a nutty little noodle-y lunch-on-the-go is just the perfect thing. Flavorful and well-dressed, it can provide your body with the energy and sustenance it needs, while providing your mouth with the joy of tasting something fantastically satisfying. Being a bit nutty can be a whole lot of fun sometimes, not to mention a whole lot of delicious; and when it’s as easy as it is to just pack-n-go, you can say goodbye to perusing the refrigerated “gourmet” packaged-food section of the grocery store during your lunch hour looking for inspiration, and bring oodles of nutty noodles from home! -Add all of the ingredients through the chopped cilantro leaves into a medium-size bowl, and toss together gently until well combined; to pack up and store, add these ingredients into a container, either a plastic Tupperware with lid, or glass container with lid that you can take with you, and store the Sweet-Spicy Peanut Sauce in a separate small container, and keep refrigerated until ready to enjoy. 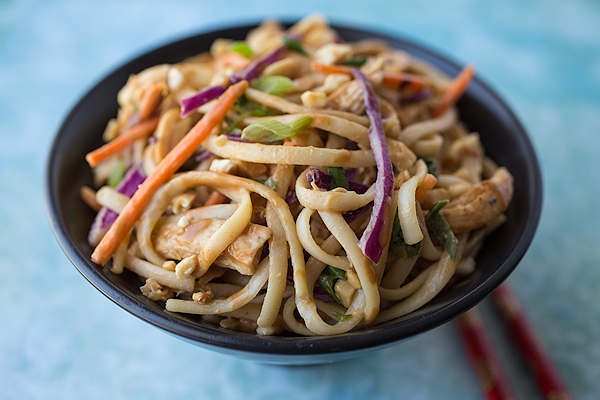 -To assemble at lunch time or when you’re ready to eat, just pour the Sweet-Spicy Peanut Sauce as over the noodles/chicken/veg (you may or may not use all of it), gently toss together to coat, and enjoy. 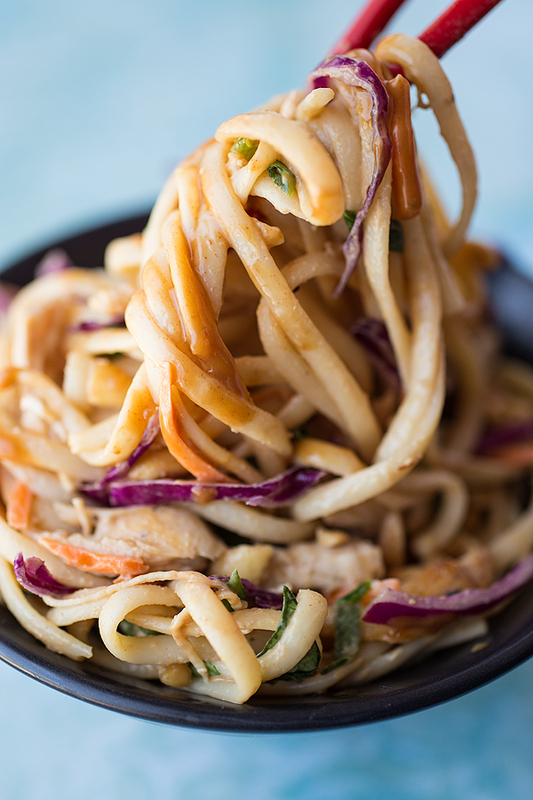 This cold noodle salad rocks! It looks delicious! Have you ever used soba noodles or rice noodles for this? Hi Ashleigh! I typically use soba noodles for a sesame-soy based dressing, as it’s just a touch more viscous; I prefer a slightly “heartier” noodle for this particular recipe, as it can stand up very nicely to a slightly thicker peanut sauce – I also love the “bite” these babies provide! Today is my birthday. I asked my husband and some friends to go hiking (we are in Hawaii) and leave me alone at the townhouse to have a quiet place to myself. For lunch, I looked at what we had in the fridge. I followed your recipe. I had a nice birthday lunch. It was ONO (delicious in Hawaiian). Mahalo. Hi Marini! Wow – I love what you’ve shared here with me – and by the way, HAPPY BIRTHDAY!!! Thank you for whisking me away for just a moment into your birthday “alone time” in Hawaii – what an absolutely neat treat that you decided to spend some of your quiet time preparing a B-day lunch for yourself; more people need to follow suit. So glad to hear you enjoyed this little salad, and thank you for coming back to share part of your special day with me! Mahalo! I have been looking for a really good asian noodle recipe for so long. When I made this I was so delighted. It’s delicious! I went and deleted all the other mediocre recipes because I knew my search was finally over. 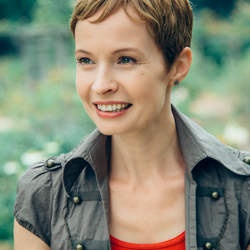 Thanks so much, Ingrid! I really love your site. Such great ideas and flavour. Leslie, I’m so glad you had the experience that you did with the recipe! I feel honored that my recipe concluded your “search” for a good Asian noodle recipe – what a neat thing! Thank you for your kind words, and for your readership. 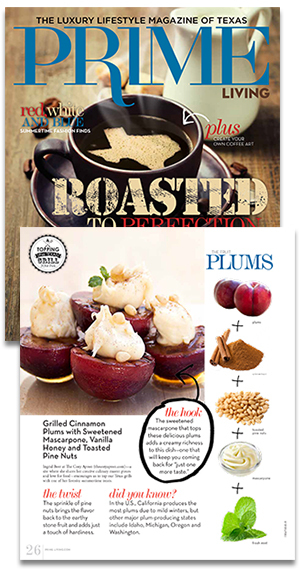 Hope you enjoy trying more of the recipes on the site! Not being able to eat soba (or any wheat) noodle and having to be very low carb as a diabetic, I use shiritaki (yam) noodles a lot. I wasn’t sure if they’d hold the sauce in this recipe since they’re “slickery,” but they did a great job! I also substituted almond butter for my peanut allergic friends, left out the chicken for us vegetarians, and added a few drops of sesame oil, some julienned cucumbers and red bell pepper, and it was a hit! I was headed to a party with folks who are following an anti-inflammatory diet (no wheat, sugar, dairy), so wanted to make something that they’d be able to have. Thanks, your spicy sauce is great! Hi Julie! Sounds like you very creatively substituted ingredients that you knew would work for you and your friends – perfect! Thanks for coming back to share the results with me; so glad you enjoyed the sauce! Your recipe sounds delicious…and I am looking forward to making it. You write that this makes one lunch portion. I just want to verify this, as to my untrained culinary eye, the recipe sounds like it makes quite a bit of salad. Hi Betty! You know, it really does make a bit more than the 1 portion—for me, it’s always difficult to prepare for only one serving, but since this was a “lunch-on-the-go”-type of recipe, it’s fairly close. (I suppose it would really depend on one’s appetite, though.) I think you may have a bit extra, but it’ll keep well in the fridge. Hope you enjoy. I made this for dinner tonight – except I assembled the noodle portion separate from the dressing. When it came time to toss the dressing, my noodles were stained by the red cabbage – should this only be made right when ready to eat? Hi Biz! That’s interesting about the staining; I haven’t experienced that, but I can totally see that, especially if you happen to get a really deeply colored red cabbage! Glad you enjoyed the flavors, and maybe next time, try patting the cabbage as dry as possible to remove as much of it’s color before adding it into the noodles. This is a recipe that really shouldn’t have to be made “on the spot”. Hope that helps for next time! Fixed this tonight, we loved it! Great texture and flavor. Added more Sriracha to it, and glad to have left overs for lunch tomorrow. Husband said the peanut sauce was “tops” in his book!! Hi Pepi, the more sriracha, the better! 🙂 So glad you and your hubs enjoyed this!